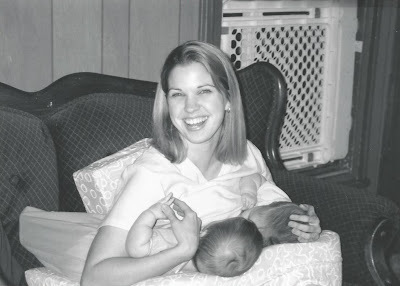 "I have been meaning to dig out this picture of me breastfeeding my twins 14.5 years ago. It was the only picture of me nursing any of my four biological babies, which is sad considering I spent three years of my life in the nursing position! In the past 6 years we have added 4 more children to our family via adoption, a newborn from the US (now 6, that I bottle fed, and can say 100% that for ME, being able to compare the two- breastfeeding was way easier than bottle feeding- and yes, I did try to get my milk to come in so I could nurse him too, but he was born early), a son from Haiti and a son and daughter from Ethiopia. We have 4 boys and 4 girls ages ranging from 6 to 16. I love seeing your magical milk pics, and I always get a little teary eyed remembering those sweet moments with my own babies." and I LOVE this picture!